1 What Qualities Should You Look For? Spring is just around the corner, and if you are into fishing and being outdoors, you must be thrilled about it. Every angler knows that the best way to access small waters is by using a fishing kayak. With the growing popularity of fishing and kayaks in recent years, choices are numerous. Many different models and brands make it hard for us to pick one. If you too have troubles deciding on the best fishing kayak for yourself, let us help you. Buying the first kayak you see on sale might seem like a great way to save money, but it isn’t really that easy. First of all, a good kayak should meet your needs. Furthermore, it should be within your budget. 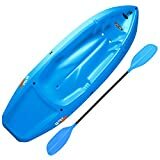 If you want to learn more about types of fishing kayaks, features, prices, etc. keep reading. If you’re looking to upgrade your fishing game, you might also want to have a look on our fish finder buying guide or this one if you are operating on a tight budget. No time to read? Click to see Amazon best sellers! Before putting on your buying pants it is advisable to gather at least some basic knowledge about fishing kayaks (and kayaks in general) and their parts. For your convenience we’ve gathered a quick information package for you to read! Let’s start with basics; every kayaker should be familiar with some basic types and features. In order to know which fishing kayak will suit your needs best, you have to know which type you need. This is the most common type, and it is most widely used. These high-volume boats have large decks which prevent them from submerging. They are ideal for challenging waters, as edged bottoms provide extra control. Creek kayaks are the longest type of kayaks. They are recommended for beginners, although experienced kayakers also use them at times. Experienced kayakers use play kayaks for performing tricks and surfing waves. The volume is centered around the cockpit, unlike with the creek kayak, where it is in the front and back. A flat hull is another distinctive feature which allows kayakers to spin around. This type of kayaks is exceptionally maneuverable but can be handled only by skillful kayakers. Downriver kayaks are something in between creek and play kayaks. You can navigate a river and also do some tricks with them. They are really great because you will feel comfortable and in control, but not bored, as they can be a source of adventure too. These kayaks are also recommended for skillful kayakers. Also, it is good to know that fishing kayaks can be inflatable and hard-body. Naturally, hard-body ones are more durable and resistant to punctures and are easier to maneuver. However, it is a bit difficult to transport them, and if there is any damage, they aren’t easy to fix. On the other hand, inflatable fishing kayaks are easy to carry wherever you go, and they come in various sizes. Also, they aren’t as hard to repair. Still, they are slower, harder to navigate, and can be damaged by sun and fishing equipment. This might surprise you, but hard-body kayaks are actually cheaper than inflatable ones. This is because inflatable kayaks use expensive materials which provide durability for fishermen. So, if you are on a tight budget or a beginner, we recommend a hard-body kayak. Each kayak has certain design aspects which affect its performance. These aspects are very important, and they can help you make an informed decision. Not everyone wants the same things when shopping for a fishing kayak. The waters you will be in, the equipment you carry, and the moves you plan to make should all be taken into account before making a purchase. Volume refers to the inner area of the kayak. High-volume kayaks are a typical choice for fishing. They are more round and seem “taller”, provide ample space in the interior, and are very stable. Most inflatable fishing kayaks are high-volume. Low-volume kayaks are typically smaller and used not only for fishing. Despite their size, they also provide ample storage space. The boat chine refers to the shape as seen from looking at them head-on. There’s a hard and soft chine. When the design takes a sharp angle upward, we call that a hard chin. The hard chine is preferred in fishing kayaks because they make spinning and turning easier. A soft chine, on the other hand, has a more forgiving design. Most kayakers choose something in between these two types. The bottom of the boat is called the hull. This part is in direct contact with the water, and there are two types: displacement and planing. Displacement hulls are narrow, and they are best for speed. Planing hulls are flat, and they provide great stability and turning. When it comes to fishing kayaks, planing hulls are better, because you won’t have to worry about overturning. When you look at a kayak from the side, you will see a bottom boat curve – the rocker. High-volume kayaks with planing hulls usually feature kick rockers while non-fishing kayaks feature continuous rockers. A continuous rocker goes along the whole length of a kayak. All kayaks have to include enough space for your feet, but some offer special areas called footpegs. Footpegs allow you to adjust the accommodation according to your body type. Appropriate footing is vital because you have to be comfortable in order to be stable in your kayak. It goes without saying that stability is one of the most important features when you are in a fishing kayak (or any type of boat for that matter). Planing hulls, wider beams, high-volume, kick rockers, and hard chines all provide excellent stability. If you are looking for ways to stay in place when leaning and moving in your fishing kayak, opt for a high-volume kayak. This type is highly recommended for fishing. Ten, or even five, years ago, the selection of fishing kayaks was rather limited. There was only a handful to choose from. Today, we have plenty of options at our disposal. Still, due to their size, kayaks are not often sold in stores. The alternative is the Internet, a giant shopping mall available from the comfort of our homes. Luckily, countless shops, descriptions, pictures, and reviews can be found online, which makes shopping easy and enjoyable. To make this decision simpler for you, we will present our best picks that are sold on Amazon. We’ve separated our picks in two separate price ranges (under $1000 and under $500) and will present you two options that are for single person use and one option for 2-3 people. Note: Clicking on the name will take you to Amazon! This small, agile fishing kayak comes with so many features that we just couldn’t resist it. Firstly, its 32-inch wide beam makes it pretty stable, which is a must-have feature. Secondly, there is a lot of storage space, even for large items. Thirdly, you can enjoy fishing all day long since the deluxe seat will make you feel comfortable throughout the day. It comes with everything you might need to get started fishing. Also, four easy-grip carry handles make transport and portability easy. When not in use, paddles are secured, preventing loss overboard. Because it is a bit short in length, tracking is slightly compromised. Maximum capacity is 300 Lbs, which some people might consider insufficient. Overall we were really satisfied with the Lifetime Tamarack Angler 100 – it tracks well and is exceptionally stabile. In terms of portability it’s also great as it weighs mere 52 lbs and has front and rear handles for easy carrying. The bottom feels hard enough that we weren’t too afraid of scrapes while fishing in low water areas. The only really “complaint” (it’s maybe a bit too strong of a word?) we had was that it just lacks the premium feel that we had with both Skipjack 90 and the BKC UH-TK219. It could be the rather dull color of the Angler 100 that unconsciously put us off because in terms of performance and build quality there’s absolutely nothing wrong with it. Quite silly but we thought it still was worth mentioning as these little things could matter to some. This kayak by Brooklyn Kayak Company is perfect if you and your family members love going on adventures together. It can fit a total of three persons. However, one person can enjoy this kayak alone as well, as it is lightweight and agile enough to be easily controlled. The total weight capacity is 440 pounds, and even when full, it guarantees comfort for all paddlers. Balance shouldn’t be an issue, even in choppy waters or swift currents. The 34-inch beam takes all the credit for the excellent stability of this fishing kayak. There is plenty of storage space, both for snacks and fishing gear for all three paddlers. You can troll for bites with the fishing rod while your hands remain free. Two aluminum paddles are included, as well as a pair of deluxe seats. Sometimes, the seats tend to slide forward as you paddle, causing you to constantly be pushing back into place. Also, for those who are on a tight budget, it might be a bit pricey. 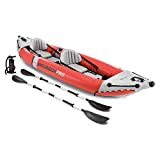 The Sun Dolphin Excursion fishing kayak has a padded back support and an adjustable seat, which will allow you to feel extremely comfortable. Large covered storage areas provide ample space for your gear, even for long-distance paddles. It comes equipped with two flush mount rod holders and a single swivel rod holder. Most importantly, stability is one of its main features, as well as tracking. If your adventure includes hiking, you needn’t worry, as Sun Dolphin is lightweight, and portaging has never been easier. Hot and sunny days shouldn’t be a problem since the UV stabilizing material from which this kayak is made will remain in perfect condition. You can be sure that your fishing kayak won’t fade or get damaged after many hours in the sun. The seat isn’t padded, so it might get a bit uncomfortable after a while. Also, this kayak is best for flat waters, and it doesn’t perform well in one foot or higher waves. Furthermore, if you are over 5’8’, you won’t have so much storage room as you would like. Overall, the Sun Dolphin Excursion is great if you are looking for a relatively small, recreational fishing kayak that tracks well. It is available in three colors. The highlight of the Nixie Sports Angler Kayak is another great “value for money” type fishing kayak. Everything about it just works and you can just feel the quality. The storage compartment works great and the stability and tracking is up to par with the rest of our picks. This inflatable 3-person kayak is perfect for a great day on the water. It is extremely durable and lightweight, so you won’t have troubles carrying it. Also, the bottom is made from tarpaulin, which provides long-lasting protection from punctures. You can adjust the seats in order to secure maximum comfort for you and your fellow paddlers. Another great news is that numerous air chambers make sure that another chamber stays inflated if one is punctured. Boston Valve lets you inflate and deflate your kayak easily. Lastly, you will stay dry thanks to the spray covers which block splashes. Although three people can fit in this kayak, it would be a bit hard for all of them to feel comfortable. Also, if you wish to paddle on your own, don’t expect to glide as fast as when you have company. Sevylor Big Basin 3-Person Kayak is a great choice for two adults and a child. 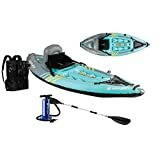 The low starting price also makes it a very affordable fishing kayak. We believe that you’ve realized that there isn’t one perfect fishing kayak for everyone. What you look for in a kayak, and what you are willing to spend will play a major role when making a decision. We hope this guide will help you make an informed and satisfactory choice. We are sure of one thing – all kayakers want to feel comfortable and safe in their fishing kayaks. Thus, your kayak should meet your needs and allow you to make the most of your days on the water. For that we’ve gathered 5 tips for kayak fishing, remember to read it too!